Note: I write my posts in the evening and then publish them the next morning. So, this was written on Monday. So, I went to Boston for the day to facilitate a social media training for Hope House Addiction Services. The trip from Maine isn’t a long one. You can get to Boston in a couple of hours. Luckily, I found my way just fine. Well, after a full day of leading the training, I decided I would blog on the return trip to Maine. Except I swear this trip is way bumpier than the ride down. 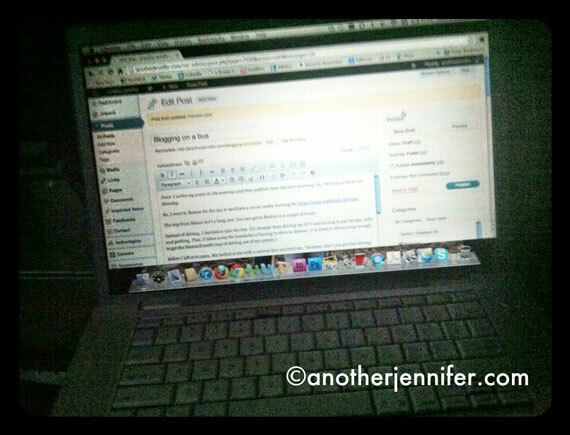 Have you ever blogged on a bus? It’s not easy. I find myself holding the laptop in place while I type. And despite the fact that we’re on the highway, the bus still shakes enough to throw me off. Plus, the song “The wheels on the bus go round and round” keeps popping into my head. It’s NaBloPoMo, and I made a promise to blog every day. No matter what. And I’m here to keep that promise. Like I told the team over at Hope House today, effective social media and blogging takes commitment and dedication. Even if it means blogging on a bus. My family won’t let me drive anymore when I go back “home” to visit them in MA….they say I’ve forgotten how to drive right and now drive like an old lady! That’s too funny, Patty. Driving certainly is different in Mass! Thanks, Chris. It was quite the adventure! Very impressed that you blogged on a bus bumps and all! I have never blogged anywhere except at my desk and on OneNote on my phone – which is not ideal – but will have to do until I invest in a tablet! Happy Thanksgiving! Happy Thanksgiving to you, Ilene!